NMPM is exactly diagonal from St. Vincent Hospital. You can drive into the 460 Office Court Complex from the Eastbound lane of St. Michael’s; once in the driveway take the first left and go to the end. Look for Building 200. 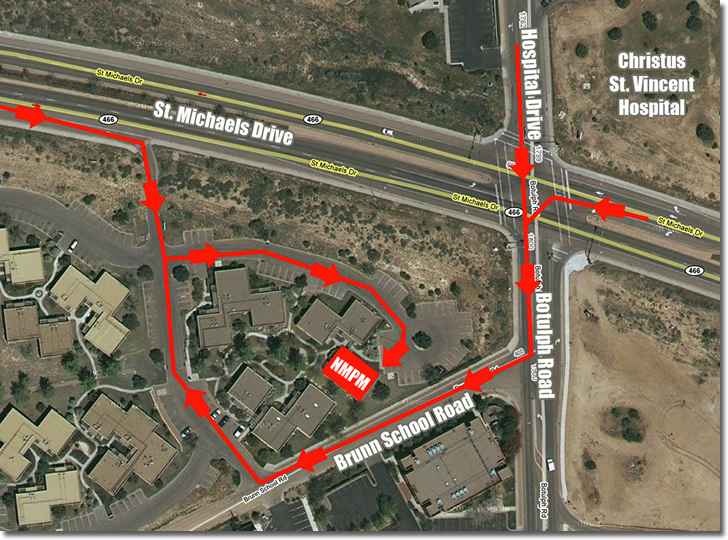 You can also turn from St. Michael’s onto Botulph Road and then turn right on Brunn School Road. At the first driveway turn right into the 460 Office Court complex. Once in the complex, turn right at the first opportunity and go to the end. Look for Building 200. I-25 to Santa Fe. Exit onto St. Francis Drive North. After two traffic lights, exit right onto St. Michael’s Drive going East. After one traffic light bear right and turn right into 460 St. Michael’s Drive. Once in the driveway, take the first left and go to the end. Look for Building 200. 68 to Espanola, 285 to Santa Fe where it becomes St. Francis Drive. Exit onto St. Michael’s Drive going East. After one traffic light bear right and turn right into 460 St. Michael’s Drive. Once in the driveway, take the first left and go to the end. Look for Building 200. 84 to 64 through Chama, to 84 through Abiquiu and Espanola, 285 into Santa Fe where it becomes St. Francis Drive. Exit onto St. Michael’s Drive going East. After one traffic light bear right and turn right into 460 St. Michael’s Drive. Once in the driveway, take the first left and go to the end. Look for Building 200. I-10N to El Paso. I-25N to Santa Fe. Exit onto St. Francis Drive North. After two traffic lights, exit right onto St. Michael’s Drive going East. After one traffic light bear right and turn right into 460 St. Michael’s Drive. Once in the driveway, take the first left and go to the end. Look for Building 200. I-40W to Santa Fe. Exit onto St. Francis Drive North. After two traffic lights, exit right onto St. Michael’s Drive going East. After one traffic light bear right and turn right into 460 St. Michael’s Drive. Once in the driveway, take the first left and go to the end. Look for Building 200. I-20E to I-10N to I-25N to Santa Fe. Exit onto St. Francis Drive North. After two traffic lights, exit right onto St. Michael’s Drive going East. After one traffic light bear right and turn right into 460 St. Michael’s Drive. Once in the driveway, take the first left and go to the end. Look for Building 200. Fly into Santa Fe (airport code SAF). There are flights directly into Santa Fe from Dallas and Denver. Wherever you may be coming from, you may be able to connect to one of those three cities to then conveniently come straight into our little airport. Or, fly into Albuquerque (airport code ABQ). The drive from ABQ to Santa Fe is about an hour.